India's relation with Japan are singularly free of any kind of dispute, ideological, cultural or territorial. Exchanges between India and Japan are said to have begun in the 6th century A.D. When buddhism was introduced to Japan. Indian culture filtered through Buddhism has impacted on Japanese culture and thought, this is the source of Japanese people's sense of closeness with India. Direct exchange in the modern era, began only in the Meiji era i.e 1868 to 1912, when Japan embarked on the process of modernization. Japan's image in India has historically been positive, going back to the early 20th century when its emergence as a big power was interpreted buy India as the beginning of Asian resurgence. Japanese support and assistance to Netaji Subhas Chandra Bose and the Indian National Army continue to shape popular thinking about Japan. In 1949 Prime Minister Jawaharlal Nehru gifted and Indian Elephant to the Ueno zoo in Tokyo. This brought a Ray of light into the lives of Japanese children suffering from the aftermath of World War-2. Scenes diplomatic relations between Japan and India were established in 1952. The two countries have enjoyed cordial relations based on Trade and economic and Technical Cooperation. The cultural agreement between Japan and India was signed in 1956 and took effect the following year after. In 1951 india established a scholarship system for Overseas students. This system to this day provides an opportunity for young Japanese scholars who are today in the forefront of Indian studies to study in India. This began to change when Prime Minister pV Narsimha Rao launched the look East policy in 1991 and started to liberalise the economy. In 1991 Finance Minister Manmohan Singh visited Japan. Japan then provided financial assistance to alleviate india's foreign currency reserves crisis. In 1998 relations between the two Nations reached a brief low as a result of Pokhran-2. At the beginning of 21st century Japan and India resolved to take their bilateral relationship to a qualitatively new level. Both realised that the current international situation characterized by interdependence and the advent of globalisation, this offers fresh opportunities to both India and Japan for enhanced engagement of mutual benefit. The foundation for this was laid when Mr Yoshiro Mori the then prime minister of Japan and Mr Atal Bihari Bajpai the then Prime Minister of India agreed during the Japanese Prime Minister's Landmark visit to India in August 2000 to establish the " global partnership in the 21st century". In 2006 india and Japan signed a joint statement towards India Japan strategic and global partnership. Japan Maritime Self defence force and Indian Navy warships took part in the Malabar 2007 naval exercises of India's Western coast. One of the menaces multilateral exercises Japan has taken part in symbolising closed military cooperation between India and Japan. 2007 was celebrated as Japan India friendship year and held cultural events in both India and Japan. In 2008 India and Japan signed a joint declaration on security cooperation between Japan and India. Japan and India are partners in peace with a common interest in promoting the security, and prosperity of Asia as well as in advancing international peace and equitable development. Containing China is not an option. China is the largest trading partner of both Japan and India, which cannot afford to disrupt their relationship with Japan. The key issue for India and Japan is how to address Asia’s current power disequilibrium, triggered by the Rapid rise of an increasingly china that is seeking to disturb the territorial and Maritime status quo. An entente between Asia’s two main democracies can help restore a fair degree of equilibrium to the power balance. PM Abe sees India as the key to expanding Japan security options beyond its current US centric framework, while PM Modi views Japan as Central to the success of India's act East policy. Both PM's of Japan and India geared to the same goal and they need each other for success. Japan sees India as important to its on economic Revival strategy, india looks at Japan as a critical source of capital and commercial technology and it partner to help upgrade its infrastructure and manufacturing base. 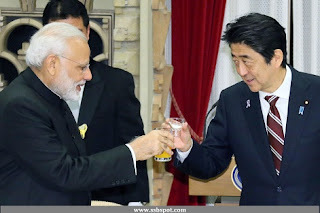 Abe's reassertion of the right of collective Self defence and his relaxation of Japan's self imposed arms export Ban have opened the path to closer military cooperation with India including co production of weapon system. India the biggest recipient of Japanese aid has already become one of the largest destination for Japanese foreign direct investment among major economies. The two countries dissimilarities actually create opportunities to generate strong synergies through economic collaboration. Japan has a solid heavy manufacturing base while india boost service led growth. India is a leader in software and Japan is a leader in hardware. India has the world's largest youthful population while Japan is aging more rapidly than any other major developed country. Whereas japan has financial and technological power india has human capital and Huge market. Japan clearly has an interest in a stronger more economically robust India. Just as Japan assisted China's economic rise through large scale investment and technology transfer for over three decades. A role obscured by the recent flare up of disputes, japan is ready to help India become an economic powerhouse on par with china. China Exports three times as much as it imports and treats India as a raw material supplier and a market for its finished goods. Without japan India collaboration, the rise of china centric Asia could become inevitable. Asia Centred Global order:Analysts point out that the Global strategic opinion is currently debating the Global power shift from the west to the East. This implies that change in international relations in the coming years. India and China are seen as the powers on the rise. Japan the largest economy in Asia is also seen as a major player. Profound impact of relations between India - China - Japan on Asia and the evolution of a multilateral Global order:In the changing International relations and shift of global focus to Asia, the relations between India China and Japan would have a profound impact on the peace, security and development in Asia and the evolution of a multilateral Global order. In political and security terms india and Japan do not have any dispute but both have Complex territorial disputes with China. Japan keen on upgrading its bilateral relations with India:Japan is very much interested in upgrading its bilateral relations with India so that the two countries can work together on the basis of global partnership and also strategic partnership. India is an attractive market for Japanese business and industry. This is more so because japan's own domestic market is expected to shrink drastically in the coming decades due to a rapidly ageing society. in recent times Japan China relations have been deteriorating due to territorial disputes. thus japan is trying to find a large and growing market comparable to China and India can fill this requirement. Many Japanese companies that have invested in China are looking for another country as well to invest in, in addition to China. This has been mainly because of so-called China risk. It is now considered a realistic threat given China's government supported demonstration targeted against Japanese business is during the height of the East China Sea Island dispute last year. India is a growing market which makes it attractive to Japanese investors. Japan's economic relations with India are now quite Deep as Japan's share of exports as well as investment to India in total has maintained an upward Trend. Japan's positive approach towards India is also beneficial for India. India is the largest recipient of Japanese official development assistance and Japan is the third largest investor in India. Japanese foreign direct investment can be utilised effectively for infrastructure development in India, including train systems and power generation, in order to swiftly tackle congested traffic and shortage of electricity in urban areas. Given their shared concerned about China, it makes sense for india and Japan to draw closer. India also has serious territorial disputes with China and it is not at all a bad idea for India to establish close ties with Japan. From a Geo political perspective, securing sea lanes in Indian ocean is critical for Japan, since natural resources, including oil and gas are shipped through it to Japan. India can prove to be an asset in this regard. As a neighbouring big country in Asia that shares the values of democracy, human rights and the rule of law, india is a key partner for Japan in terms of natural security and peace and the stability of the region. The domestic and regional political and economic environment is conducive for a deepening of the japan India bilateral relationship and for the two countries to co-operate closely on security. Cooperation between them can influence the future direction of not only Asia but also the international community. PM Modi told the Japanese Businessman That India Was awaiting the investments with a red carpet and not red tape as rules and procedures have been used by his government. There has been talk about billions and Millions but there has never been talk of trillions referring to 3.5 trillion Yen promised by japan to india through public and private funding over the 5 years of various works including building of smart cities and cleanup of the Ganga river. South Indian prime minister has been able to extract such a Mammoth investment pledge from any foreign power in one single visit. During the talk between modi and Japanese Prime Minister, the two sides agreed to enhance their defence and strategic Corporation to a new level and also decided to speed up negotiations on civil nuclear deal that could not be concluded now. Both sides urged and supported the Asian Development Bank to enhance its capacity to address the reasons infrastructure and connectivity needs. In Kyoto a pact was signed under which Modi's Lok Sabha constituency varanasi would be developed on the pattern of the Kyoto Smart City with the help of Japan. Prime Minister shinzo abe also announced that as an example of India Japan cooperation. Tokyo will help India in providing financial technical and operational support to introduce bullet trains, project that Prime Minister Narendra Modi have been actively pursuing.